RADAR stands for Radio Detection And Ranging: a fairly accurate description of what it actually does. Radar systems use radio waves to find out the distance of an object, its speed and direction, and its height. You’ll have experienced something very similar to the technique that radar uses: echo. When a loud noise is made in the right conditions – in a canyon, or down a well – the sound wave can reflect back off the surface (at a quieter volume), and make its way back to your ear. This is the first phenomenon radar uses to detect objects, only it uses pulses of radio waves, rather than sound waves. When the radio waves are reflected off the object, a much quieter version hits the receiver, and the system can then translate this into an object’s distance (depending on how long the full cycle, from emitting the initial radio signal to receiving the response, takes). The second phenomenon used by radar systems is Doppler shift. More commonly known as ‘red-shift’, you might think of astronomy when you hear about it, as it’s used to measure the speed at which other objects in the Universe are moving away (or towards) our Earth. But the Doppler shift occurs for all waves, including sound waves: ever heard an ambulance’s siren change as it drives past? To someone standing behind the ambulance, the speed of the ambulance moving away counteracts the speed of the wave moving towards them, meaning that the wave spreads out. This, in turn, means that the wave has a lower frequency and “sounds” lower. The same is true in reverse: someone standing in front of the ambulance hears a higher sound than the one the ambulance is actually making, because the sound wave is compressed when the ambulance’s speed is added to it. Radar isn’t just used to track planes from air traffic control towers, but also to measure the speed of cars, track satellites, and map the Earth. A seriously useful system using the power of a simple radio signal – amazing stuff! 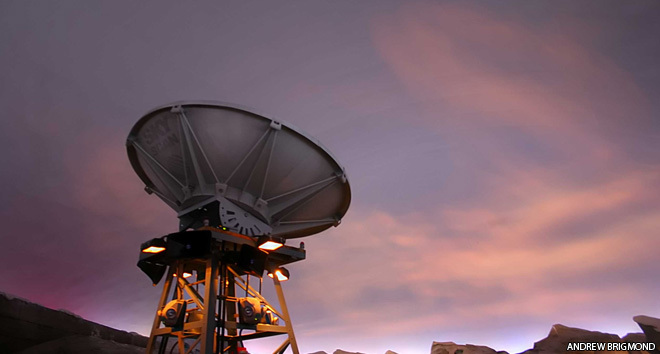 Hi.. well I have a question, how to make a radio telescope using dish and how to connect it to my laptop?